Sorley MacLean knew and was friends with a number of writers and scholars, who influenced his intellectual development and in some cases his writing. This section will chronicle the links between the poet and his principal literary associates over the years. This phase deals with a few of the people who influenced the young Sorley MacLean during his time studying in Edinburgh and immediately afterwards. Further material will be added to this section in subsequent phases. Please note that full citations will be also be added, along with details of the main unpublished and published sources for the study of each figure that is listed. 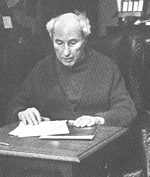 George Davie was born in Dundee in 1912, and received his early education at Dundee High School, before going on to the University of Edinburgh to study philosophy. It was there that Sorley MacLean first met George Davie in the summer term of 1933. Shortly afterwards, George Davie introduced Sorley MacLean to his friend, J B Caird, and the three men became firm associates. Both men had an important influence on the young poet, and it was through George Davie that MacLean was introduced to Hugh MacDiarmid. Sorley MacLean saw the influences of George Davie and J B Caird upon him as complementary. Of George Davie, he wrote that he ‘had a tremendous knowledge of all things in Scotland, and he was fundamentally interested in ideas and his range was immense’. In his essay, ‘Sorley MacLean: a Personal View’ (Sorley MacLean. Critical Essays), J B Caird gives a detailed description of these early meetings, and the substance of their discussions. Subsequently, George Davie became a teacher of philosophy in the University of Edinburgh, and one of Scotland’s most distinguished thinkers and philosophers. His principal work, The Democratic Intellect, was published in 1961, and its ideas and its ‘philosophical erudition’ had a profound influence on Scotland’s writers, teachers and thinkers, and to a large extent has been responsible for defining ideas on democracy and education and culture in Scotland. The reputation of Davie’s philosophical scholarship not only influenced his own and succeeding generations but spread from Scotland across the world. 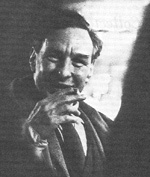 In 1986, George Davie published his second principal work on The Crisis of the Democratic Intellect. After retiring from the University of Edinburgh, he lived in Edinburgh with his wife, the writer Elspeth Davie, who predeceased him a number of years ago, and then, most recently, in Wiltshire where his daughter lived. He passed away on 20 March 2007, at the age of ninety-five. In his appreciation of George Davie in the Herald (29 March 2007), Professor Lindsay Paterson wrote: ‘George Davie was one of that very small group of Scottish intellectuals to have shaped the way the nation thinks about itself. … By having taught and having written, he has also ensured that an older and more distinguished tradition would remain available to us – a belief that intellectual rigour, more widely practised than seems possible today, is democracy’s only secure basis’. Sorley MacLean and J. B. Caird met in Edinburgh while the former was taking teacher training at Moray House, and Caird was a second year undergraduate in the University of Edinburgh. J. B.Caird’s close friend, the young philosophy student George Davie, introduced the two men. The most detailed account of their friendship is given in [J. B.] Caird’s essay ‘Sorley MacLean: a Personal View’ (Sorley MacLean. Critical Essays). When Caird first met Sorley MacLean, he recalled that, along with his scholarly bent, he thought that he was a perfervid Gael and a man of strong socialist convictions. He felt that he was a man of absolute integrity and intellectual honesty, but, at the same time, he had too trusting and generous a nature. Caird described the young poet in these terms: ‘In company he sat in silence, brooding over something or other (he had little gift for small talk), until a chance remark on a subject that touched him would arouse his interest. He would rise to his fee, his eyes would flash, and a torrent of rhythmically cadenced, magnificent language would pour forth: a kind of vatic fury would possess him’. Writing of the complementary influences of J B Caird and George Davie, Sorley MacLean said of Caird: ‘Caird was, I think, outstanding, as I said, in his combination of literature and what I would call sensibility’. Their literary discussions ranged over Greek, Latin, French, English and Scottish poetry, and on the work of poets such as Yeats, Eliot, Valéry, Pound, Lawrence, MacDiarmid, and the emerging MacSpaunday group (Auden, MacNeice, Spender and Day Lewis, so termed by their critics), but, in Caird’s words, ‘We nearly always came back to MacDiarmid and Yeats, to whose work we were passionately devoted’. J. B. Caird visited Skye in June 1935 and, while there, visited Sorley MacLean’s home in Raasay, being rowed across from Braes by Sorley MacLean’s father and some of his friends. That evening, on Raasay, he was present at a ceilidh in Sorley MacLean’s grandfather’s home, and Caird recorded: ‘That night was spent in song and story, and I counted myself privileged to be there. It was a revelation of a way of life, a culture, that had persisted despite forces inimical to it, throughout untold centuries’. Sorley MacLean and J. B. Caird’s friendship continued in Edinburgh where they were both teaching, and Caird recollects how Sorley MacLean would read out his as yet unpublished poems to the Cairds in their flat in the New Town. Their paths separated during the war years, but they met again when Sorley MacLean was teaching in Edinburgh and J. 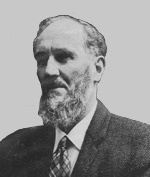 B. Caird was teaching in Peebles. Later, their paths crossed again when Sorley MacLean was Headmaster of Plockton Secondary School and J. B. Caird was a member of Her Majesty’s Inspectorate of Schools for Ross and Cromarty. On retirement, J. B. Caird, and his wife Janet, settled in the town of Inverness. Their friendship was life-long, and for all the official recognition that Sorley MacLean received from the 1970s, Caird wrote that ‘throughout it all he has retained his integrity and – I use the term in a favourable sense – his admirable simplicity’. Hugh MacDiarmid was born Christopher Murray Grieve on 11 August 1892 in Langholm, the son of a rural postman. He was educated at Langholm Academy, where at an early stage he came under the influence of one of his teachers, Francis George Scott, the composer. Sorley MacLean first became aware of his work probably through his friends J. B. Caird and George E. Davie, who introduced him to MacDiarmid’s poem, ‘A Drunk Man Looks at the Thistle’. J. B. Caird recollected that the three of them spent an evening either in Sorley MacLean’s digs or in George Davie’s reading and discussing the poem. It was George Davie who then introduced Sorley MacLean to Hugh MacDiarmid in Rutherford’s Bar in Drummond Street, a former haunt of Robert Louis Stevenson, in May 1934 when MacLean was completing his studies at Moray House. Their meeting established a friendship that continued until MacDiarmid’s death in 1978. By the time they first met, MacDiarmid had already developed an interest in Gaelic poetry and, in particular, in the poetry of the 18th-century Jacobite poet, Alexander MacDonald (Alasdair MacMhaighstir Alasdair). 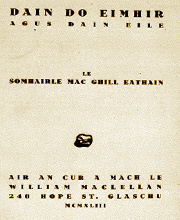 In a letter written from Raasay on 27 July 1934, held in Edinburgh University Library, Sorley MacLean writes to Hugh MacDiarmid to tell him that he has finished translating Duncan Ban MacIntyre’s ‘Ben Dorain’ and Alasdair MacMhaighstir Alasdair’s ‘Moladh Moraig’, and that he is now engaged on translating Alasdair MacMhaighstir Alasdair’s ‘Birlinn’. The following year, Sorley MacLean accepted MacDiarmid’s invitation to visit him on Whalsay, and the visit took place at the end of July and beginning of August 1935. Shortly afterwards, MacDiarmid fell ill and was admitted to hospital in Perth. From correspondence held in Edinburgh University Library, it is clear that Sorley MacLean invited MacDiarmid to visit him at his home in Raasay, and MacDiarmid’s visit eventually took place in 1937 in the company of W. D. MacColl, when the two men stayed for a night on Raasay with the MacLean family before going to Portree to spend the weekend with Sorley MacLean, en route for Barra to see Compton Mackenzie, as MacDiarmid collected material for his book on The Islands of Scotland. Sorley MacLean’s view on the influence of Hugh MacDiarmid is complex. In a letter to Douglas Young in 1941, he stated: ‘I immediately recognised the lyrics of Sangschaw and Penny Wheep as supreme. … There is nothing on earth like the greatest of these lyrics’. He referred to MacDiarmid’s early lyrics as having a ‘tremendous influence on me’, but at the same time he wrote, ‘I wouldn’t say that these lyrics of Hugh MacDiarmid influenced my own poetry much though they had a kind of catalystic influence …’ Elsewhere, he wrote, ‘I was committed to Gaelic poetry before I had read a single poem by MacDiarmid’. The two men remained close friends although geography made it less easy for them to meet frequently after Sorley MacLean moved to Plockton. MacDiarmid contributed a note to the sleeve of the first published recording of Sorley MacLean reading his own work, Barran agus Ashbuain, in 1973, and MacLean visited the older poet at his home at Brownsbank, near Biggar, in February 1977. By this time, MacDiarmid was in failing health, and at his deathon 9 September 1978, Sorley MacLean wrote a moving obituary, ‘Lament for the Makar’, in The Times Educational Supplement on 15 September 1978.
of Sorley MacLean’s, describes how he met Robert Garioch in the Freeman office at the top of India Buildings in the West Bow in Edinburgh, and of how his friend George Davie had spoken of ‘a young Edinburgh teacher called Sutherland, who was making effective poetic use of the language of the Edinburgh streets’. 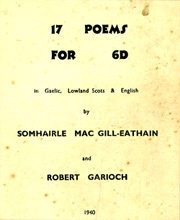 Robert Garioch had his own hand press and from it there appeared a slim pamphlet by Sorley MacLean and Robert Garioch, 17 Poems for 6d, with the imprint date 1940. This was Robert Garioch’s first publication from his press. 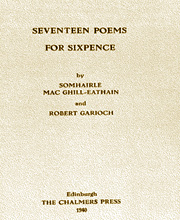 Seventeen Poems for Sixpence, a second issue, with corrections, was published a few weeks later. During the Second World War, Robert Garioch served in the army, and was imprisoned in Italy and Germany between 1942 and 1945. He spent his career teaching for a while in Edinburgh but mostly in the south in London and Kent, returning to Edinburgh upon retirement in 1964. J. B. Caird has commented that Sorley MacLean’s relationship with Garioch was not as close as his intellectual friendship with Hugh MacDiarmid, but that they liked, respected and appreciated one another. At one level, Garioch was inclined to view both poets as politically naïve, and in a letter to Sidney Tremayne on 15 August 1977, he wrote that he saw MacDiarmid as ‘a woolly lamb, and Sam Maclean also, intelligent all right, but so soft emotionally that they give up thinking when their feelings take over …’ As a poet, Robert Garioch had a special affinity with the 18th-century Edinburgh poet, Robert Fergusson. His single prose work was Two Men and a Blanket (1975): and his Collected Poems (1977) was followed by The Complete Poetical Works, ed. Robin Fulton in 1983, and in 2004 by Robert Garioch. Collected Poems, ed. Robin Fulton, which restores entirely Garioch’s own ordering of his poems. Sorley MacLean was introduced to Sydney Goodsir Smith, the poet, by Robert Garioch in 1939, as one of the coterie of poets who frequented the Abbotsford Bar in Rose Street in Edinburgh. They became firm friends. Sydney Goodsir Smith’s father was a New Zealander, who held the Chair of Forensic Medicine in the University of Edinburgh, and his mother was Scottish. The young Goodsir Smith was educated at Malvern College and started on the medical course at the University of Edinburgh. His distaste for practical anatomy, however, eventually led him to abandon the medical course at Edinburgh, and to move to Oxford to study at Oriel College before returning to Edinburgh. Sorley MacLean married in 1946, and after his marriage he and his wife, Renee, became close friends with Sydney Goodsir Smith and his wife, both families sharing a house in Craigmillar Park for about eighteen months, before the MacLeans then moved to Atholl Place. This period is written about in Goodsir Smith’s Under the Eildon Tree (1948). During this time Sorley MacLean entered actively into the literary life of Edinburgh, and he saw a lot of Sidney Goodsir Smith. J. B. Caird recollects how whenever he saw Sorley MacLean during this period, he was full of amusing stories about his fellow poet, ‘The Auk’, as he was known, and he comments on how Goodsir Smith’s unconventional ways and witty conversation intrigued Sorley MacLean. Goodsir Smith’s first book was Skail Wind (1941), and he also published Carotid Cornucopius about life in Edinburgh in 1947. Douglas Young was born in Tayport, Fife, on 5 June 1913, and spent his early years in India, where his father was involved in the jute industry. He was educated at Merchiston Castle School, and afterwards studied classics at the University of St Andrews and New College Oxford. In 1938 he was appointed to lecturer in Greek in the University of Aberdeen. By 1940, he was in correspondence with Sorley MacLean, and some months before going abroad on war service in 1941, Sorley MacLean commented in a letter to Hugh MacDiarmid that he had left his poems with Douglas Young in Aberdeen and John Macdonald, then lecturer in the Department of Celtic in the University of Aberdeen. Christopher Whyte’s introduction to his edition of Dàin doEimhir (2002) offers the most detailed account of the correspondence surrounding Young’s preparation of the poems for publication. 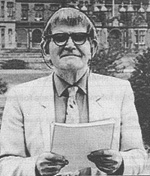 Douglas Young was imprisoned in 1942 because of his repeated public objection to theBritish Government’s authority to conscript in Scotland, and while he was imprisoned, the task of overseeing the publication fell to the Rev. John MacKechnie. Douglas Young was, however, able to continue his work of translating Sorley MacLean’s poems into Scots while he was in prison, and these were published in Auntran Blads in 1943. Douglas Young, in a letter written to Sorley MacLean on 21 April 1943, refers to him as a consummate Gaelic poet. Sorley MacLean, too, admired Douglas Young whom he described as ‘of an aristocratic mind and temperament’. In her essay on ‘Sorley MacLean: the Man and his Work’ (Sorley MacLean.Critical Essays), Joy Hendry has commented that Sorley MacLean did not feel the same sense of political kinship or intimate feeling of closeness politically with Douglas Young as he didwith Hugh MacDiarmid. After the war, Douglas Young went from Aberdeen to Dundee and thence to the University of St Andrews, where he lectured in Greek. He was active in Nationalist politics both before and after the War, leading the Scottish National Party for some years. He followed a distinguished career as a scholar, and was known as a poet and writer, until his death at an early age on 23 October 1973. Below is a selection of Sorley MacLean’s principal works: for a more comprehensive listing of his published writings, please consult the Bibliography section. Somhairle Mac Gill-Eathain and Robert Garioch. 17 Poems for 6d: in Gaelic, Lowland Scots & English. [Edinburgh: Chalmers Press],1940. On returning to Edinburgh in 1939, Sorley MacLean had renewed his friendship with the Edinburgh poet Robert Garioch. In January 1940 a slim pamphlet of the poems of Sorley MacLean and Robert Garioch, printed on Garioch’s own hand press, appeared under the imprint of ‘The Chalmers Press’. The volume contained eight Gaelic poems by Sorley MacLean, six poems in Scots and two in English by Robert Garioch, and a translation by Robert Garioch of MacLean’s Dàin III, ‘Cha do chuir de bhuaireadh riamh (Never has such turmoil). The eight Gaelic poems by Sorley MacLean were four sections from ‘Dàin do Eimhir’ (XXIX, IV, XIV and III), a section from ‘An Cuilithionn’ (The Cuillin), ‘Trì Slighean (Three Ways), dedicated to the poet Hugh MacDiarmid, ‘A’ Chorra Ghritheach’ (The Heron), and ‘An t-Eilean’ (The Island). Copies of this issue of the work are extremely rare. Somhairle Mac Ghill-Eathain and Robert Garioch. Seventeen Poems for Sixpence. Edinburgh: The Chalmers Press, 1940. Somhairle Mac Ghill Eathain. Dàin do Eimhir agus Dàin Eile. William MacLellan: Glaschu, 1943. When Sorley MacLean was sent abroad on war duty in 1941, he left his poems with Douglas Young, who had volunteered to find a publisher for them. When Young was imprisoned, the task of overseeing the publication was taken over by the Rev. John Mackechnie. 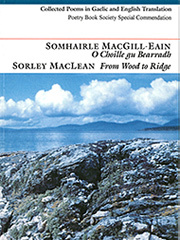 The book was in proof when Sorley MacLean arrived back in England to convalesce in March 1943. William MacLellan, the Glasgow publisher, assumed responsibility for publishing the work, with a subsidy from the Catherine McCaig Trust, and it appeared in early November 1943, with an introductory note by Douglas Young, and illustrations by the Scottish artist William Crosbie. The volume was arranged in two sections: ‘Dàin do Eimhir’ (Songs to Eimhir), forty-eight love poems numbered I to LX, but with some significant gaps; and ‘Dàin Eile (Other Poems), along with English prose translations of some poems. On publication, the work received a number of favourable reviews. Sorley MacLean. Poems to Eimhir, translated from Gaelic by Iain Crichton Smith. London: Victor Gollancz, 1971. The publication of Iain Crichton Smith’s English translations of thirty-six of the poems in the ‘Dàin do Eimhir’ sequence in 1971 was an important milestone in that it made Sorley MacLean’s poems more widely available to non Gaelic-speakers. A paperback edition of Crichton Smith’s translations was also published in the same year in the Northern House Pamphlet Poets series (no. 15). Somhairle MacGill-Eain/Sorley MacLean. 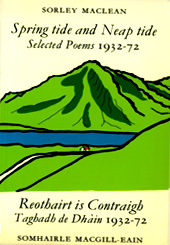 Reothairt is Contraigh: Taghadh de Dhàin 1932-72/ Spring tide and Neap tide: Selected Poems 1932-72. Edinburgh: Canongate, 1977. The first major collection of the poet’s work, with poems selected by him and with his own English translations, appeared in 1977. The poems cover the period 1932 to 1972, with about 40 poems from the ‘Dàin do Eimhir’ sequence, and about 30 later poems (already published in books and periodicals). In this edition the distinction between the ‘Dàin’ and other poems was abandoned, and the poems were grouped under a number of headings. Also included were two new poems: ‘Dol an Iar’ and ‘Soluis’. The typographer and book designer, Ruari McLean, designed the jacket for this handsomely produced volume. Somhairle MacGill-Eain/Sorley MacLean. 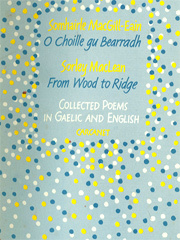 O Choille gu Bearradh/From Wood to Ridge: Collected Poems in Gaelic and English. Manchester: Carcanet, 1989. 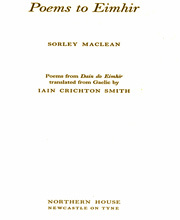 Sorley MacLean’s Collected Poems in Gaelic were first published, with his English translations, in 1989 by Carcanet, the Manchester-based publishing house. The poems are arranged in a number of sections by chronology, and a number of the sections are also titled, for example, ‘An Tràigh Thathaich’ (The Haunted Ebb), December 1939-July 1941 and ‘An Iomhaigh Bhriste’ (The Broken Image), August 1941-April 1944.. The volume has a preface written by the poet in which he describes in detail the early influences on his poetry. Somhairle MacGill-Eain/Sorley MacLean. O Choille gu Bearradh/From Wood to Ridge: Collected Poems in Gaelic and in English translation. Manchester and Edinburgh: Carcanet/Birlinn, 1999. A fully revised and corrected edition of the Collected Poems was issued by Carcanet and the Edinburgh-based publishing house, Birlinn, in 1999, three years after the poet’s death in 1996. This edition also contains the preface by the poet, which first appeared in the 1989 Carcanet edition. Somhairle MacGill-Eain/Sorley MacLean. Dàin do Eimhir/Poems to Eimhir, edited by Christopher Whyte. Glasgow: The Association of Scottish Literary Studies (ASLS), 2002. This is the authoritative edition of the ‘Dàin do Eimhir’ sequence of love poems, with an extensive introduction and detailed commentary on the poems by Christopher Whyte, Gaelic poet and scholar. The edition brings together all but one of the whole of the cycle of the ‘Dàin do Eimhir’ poems, and includes six that have not previously appeared in print. 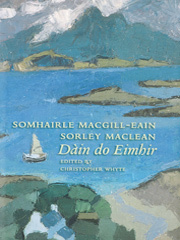 Dàin do Eimhir, edited by Christopher Whyte. Birlinn, Edinburgh. ISBN: 1 84697 025 3. Publication date: August 2007.